You are currently browsing the tag archive for the ‘Jehad Nga’ tag. Last year, in response to Jehad Nga‘s Turkana portfolio, I said, “consumers of media haven’t changed enough, and Nga has hardly changed at all.” My criticism was that Nga had adopted the same chiaroscuro technique for the Northern Kenyan tribesmen as he had U.S. Marines, Somali pirates and Kenyan boxers. It was my first real foray into negative criticism* and to my surprise Nga emailed and said he could agree with a lot that I said. That opened up a year long dialogue that resulted in an interview recently published for Wired.com. In the Wired interview, Nga explained he had recently been on special assignment with a second unit crew on the shoot of a feature length drama. Nga who lives mainly in Nairobi, with an apartment in NYC, has spent most of his professional life in the heat and bustle of North Africa, sub-Saharan Africa and the Middle East. I was pleased to see then that John Bailey‘s well-written and meaty blog for the American Society of Cinematographers (ASC) had featured a selection of Jehad’s work. See for yourselves how this work differs wildly, and read in my interview why Nga really needed a change. I followed Jehad Nga‘s work before on Somali Pirates and US Marines. 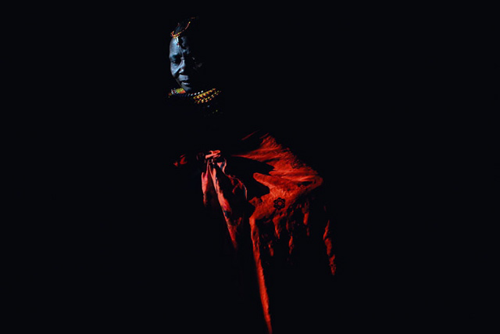 It is in consideration of those two inquiries, and of Nga’s similar depiction of Kenyan boxers, I wonder about Nga’s choice to use the same shaft-of-light-in-the-dark technique to photograph the Turkana people of Northern Kenya. WSJ Online didn’t mention Nga’s repetition of form. Nga photographed Turkana while covering the drought in Northern Kenya for The New York Times. If DLK had accounted for Nga’s earlier projects it may have retreated away from attributing Nga’s technique to echoes of colonial ethnographic photography. The real problem with Nga’s photography is that it’s production is a performance in which he as the photographer is implicated. Nga’s work is art, there can be no doubt. Nga’s portraiture will always bestow dignity upon sitters, but never inherently any understanding of the sitter. He is a director of his world. Nga speaks well about My Shadow, My Opponent – photographs of Kenyan boxers. I especially like Nga’s comparison between the boxers in Kibera, Nairobi and US marines in Iraq in how they behave the longer they exist as a group. Nga tempts us in with silky colour-saturated and pitch black prints. We are then duty-bound to position ourselves politically or emotionally with the subject; this is a lose-lose strategy. Instead, we should be using Nga’s work as a springboard of natural interest into the very specific problems pertaining to this region of the world. Is a gallery wall the best way to reach the largest possibly number of potential supporters? Personally, I don’t think so, but this is a problem of distribution not solely one for the artists. I support DLK’s expression of unease but I must disagree that, “Nga’s pictures undeniably draw the viewer into the individual narrative of a specific person or family.” Really? I see a lot of similar looking photographs. I don’t think the issue is that things “haven’t changed much”, it’s that photographers and consumers of media haven’t changed enough, and Nga has hardly changed at all. The main reason I focussed on Nga’s work back in December was because his pirate-subjects were imprisoned. Nga’s work at the time was featured in Time Magazine and The New York Times and I’d be lying if I wasn’t part of the consuming public that took more notice of the pictures than the politics. Since the close of 2008, activities in the Gulf of Aden have ramped up. So has Nga’s career; in photojournalist terms he unleashed another blockbuster this week with his portraits of US Marines in the New York Times. I’ll confess – I’m a sucker; I think Nga’s Chiaroscuro portraits are irresistible. My only problem is that the same aesthetic has been put in place by Nga and I am left confused. Nga described the jails in which Somali pirates were kept as dark and dank, so his visual language makes sense when working in that context. Has he made multiple photo essays of high contrast, using vibrant colour-schemes and dark negative space. Nga, has to my mind, forged himself a visual brand. What is the end result of this? Is Nga just playing a longview game, in which his brand sustains longer than the stories? Is Nga just giving the public the cinematic frames it has lapped up previously? Is it problematic that he gives the same treatment to the ‘vilified pirates’ and ‘patriotic heroes’ we’ve seen in the newspapers this week? Are my queries unfair. After all one man’s terrorist is another’s freedom fighter. One man’s criminal is another’s political prisoner. Is it even Nga’s place to distinguish, or use visual devices to shape viewers’ thinking? We’d do well to remember Brando and Pacino played great villains, but they were villains we loved to hate. What do you think? Do you contemplate the character of a subject differently when it is struck by bright pockets of light if it is an American soldier or Somali pirate? How do you reconcile that? All images, except the Godfather II and Apocalypse Now still (final image) ©Jehad Nga. Jehad Nga and Pirates Inc. When intellectual withdrawal sets in, I stem the tide and sate the need at a handful of reliable dispensaries. It would seem that two weeks ago, three of my favourite cartophiles (not a word) jumped on the same bandwagon boat. The boldest at-sea-heist of the modern era had just taken place, and it seemed the misfortunes and misadventures on petrochemical distribution routes were top of everyone’s agenda. Spurred by a AP photo in the New York Times (below), the indubitable Brian Finoki focused on the inseparable threads of the pirate clique, theorising that without their vessel, the posse of pirates had only each other to stay afloat in the hard concrete prison yards of Mombasa. BLDGBLOG was twisting its melon, highlighting improv google map action along with the official sounds coming out of the International Maritime Bureau and its Live Piracy Report. Meanwhile, InfraNet Lab could only conclude that piracy was the opportunist’s career of choice given the current absence of government in Somalia. I need my own bent on this and so refer you to Jehad Nga‘s phenomenal Pirates Inc. Somalia photo essay depicting pirates under lock and key in Boosaaso Jail & Mandhera Prison, Somalia. Nga is no slouch – he has (largely self-funded) returned to Somalia repeatedly over the past three years. It is incredibly dangerous to work within Somalia. It is more dangerous, in some regards, than in Iraq or Afghanistan where journalists can rely on isolated cordoned-safe-green-military zones and when at large, can work embedded with Western forces. But Nga is no stranger to Iraq either; as foto8 reminds us, “Nga has worked widely in Iraq on assignment for the New York Times. His image of blindfolded Iraqi prisoners arrested by US forces was used as the main publicity shot for the Oscar-winning documentary, Taxi to the Dark Side“. Nga: Looking over that Somaliland naval map I noticed that the Gulf of Aden (the narrow band of ocean that separates Somalia and Yemen) and the Somali cost line were littered with upward of 100 little skull and cross bone flags. Black flags to denote ships that were successfully taken by pirates and gray for ships that were attacked by pirates but managed to escape. Most of these flags are black. Housed in the Mandhera Prison in Somaliland are 719 inmates 5 of whom are serving 15 yrs sentences handed down to them for their involvement in Somalia’s thriving pirate industry. The autonomous region of Somaliland is doing their part to combat the growing influx of pirates in the gulf and coastal areas. Utilizing the small fleet of gunboats and navy personnel, they patrol their waters and on occasion escorts’ ships coming in from Yemen. Somalia, in stark contrast to Somaliland, still suffers from the turmoil that has put the country on the map for many people for the last 17 yrs, when the country made a dramatic turn from relative stability to brutal civil war in 1991. Pensive and quiet the 5 men sat surrounded by prison guards and told their stories of how and why, before one by one they were ushered away and led back to their various cells shared amongst the general population of criminals in the eight block prison set miles out into the arid desert. In recent months the port town of Boosaaso has also made a name for itself as the kidnap capital of Africa. Previously known best for being the main hub for human smuggling for Somalis eager to flee to nearby Yemen and usually coasting them their lives. With piracy on the rise and stakes getting higher, it is rumored that the money trails lead to some top government officials in the area – due to the large sums of money pirates now demand in return for a seized vessel. Traveling through Boosaaso it is necessary and commonplace to hire a security details consisting upward of 10 local militia to be a deterrent for anyone hoping to cash in on captured a western journalist that, in the past year, has proven to fetch a good price. Maneuvering through Boosaaso we traveled with our rented army toward Boosaaso‘s main jail where currently 100 captured pirates sit out their long sentences or await trial. In Boosaaso, if the kidnappers don’t find you the extreme heat always finds a way. In an open and shadeless courtyard, two facing jail blocks contain hundreds of prisoners literally caged to bake in the sun. The heat so heavy against your back. It was not only the hope of better pictures that tempted me to enter these filthy concrete boxes, but also escape from the looming mid day sun heavy over head. As I approached the iron bars of the blocks movement is heard and then and as came closer murmurs grew into rumbles and further until the deafening sounds of hundreds of inmates came crashing against me like a wave of anger and despair. [They] stretched their arms through the bars inviting us to listen to their stories of how they were dying in this place. Of how each of them was suffering from one disease or another. Beyond the out reached hands just eyes and parts of their faces could be made out inside the lightless rooms. Figures moving in and out of the small amount of light streaming in from the between the blue painted bars. As pirates are proud of their catch so are the guards of these jails. They know that their numbers will remain consistent as long as Pirate season persists in the Somali waters. No slow down is the trend in expected as little international help has been organized, and with numbers of active pirates in these waters continuing to grow even that help seems, in some ways, futile.